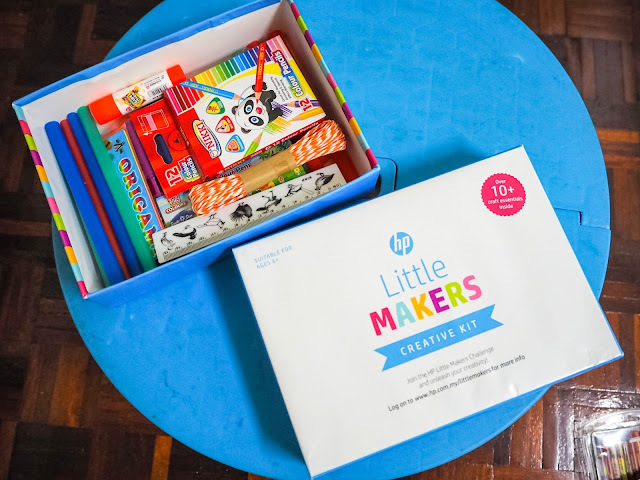 Mummies and daddies, have you joined the HP Little Makers challenge? HP Malaysia’s Little Makers challenge is designed for parents, teachers and their young makers, creators, and thinkers to play and learn together while sharing their creations with friends and family. The HP Little Makers Challenge is open for children between 5-12 year old to participate in challenges. Participating kids and their families stand a chance to win RM500 worth of HP products. Five winners are chosen every two weeks in-line with the “Challenge of the Week”. while schools stand a chance to win a HP Idea Lab worth RM20,000. Miya and I received our Little Makers Creative Kit last week and we decided to try out the week 3 challenge: Behind The Scenes. In this challenge, we will need to create shadow puppet from the famous English nursery rhyme Hey Diddle Diddle. Shadow puppetry is a popular form of entertainment in countries all over the world. The figures that are placed between a light and a screen and the story will be told. First Miya had to color all her characters before we could cut it out and paste it on the ice cream stick, after that it's storytelling time. This is the first time we've created our own puppets, Miya is super happy, think I can start making other story puppets to spice up our storytelling session the next round. 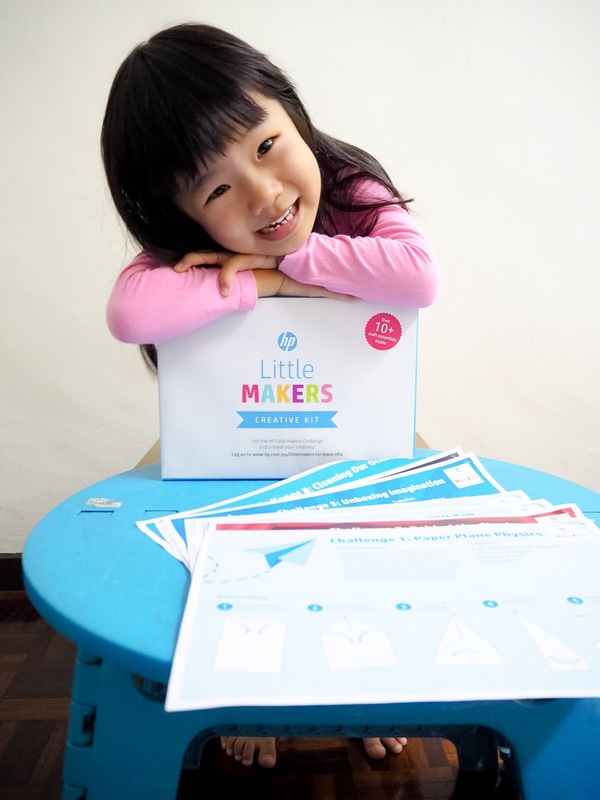 So parents, don't forget to join the HP Little Makers challenge, the challenges will be updated bi-weekly on www.hp.com/my/littlemakers with a step-by-step guide for a small project accompanied with educational fun facts of the relevant topic. 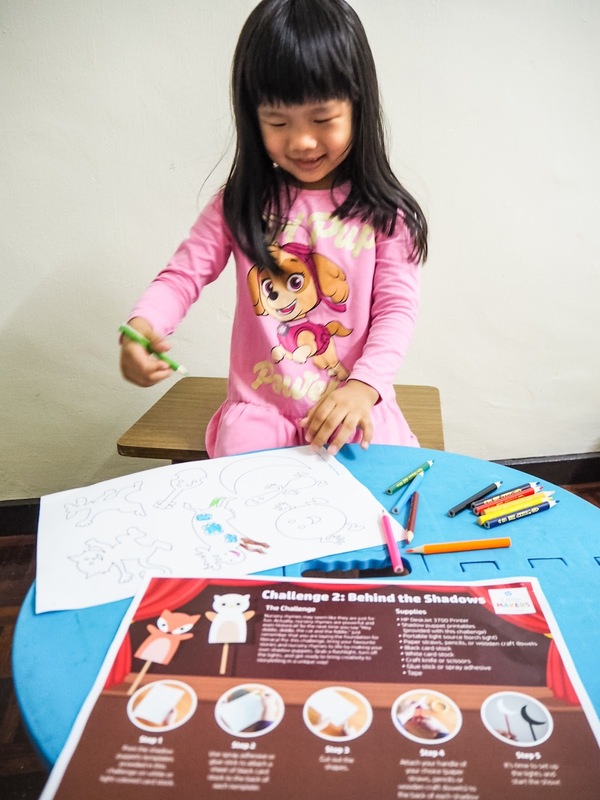 For instance, children will be able to learn about constellations like ‘Lyra’, ‘Pegasus’, ‘Sagittarius’, the science behind shadow and the art of shadow puppetry, creating a sundial, building a map and mark the landmarks around the world and animals which are in danger of extinction. * Instagram and/or Facebook profiles must be set to “Public” and ensure that all postings are made available throughout the entire campaign duration and until the winners have been announced. For more details, regarding the Little Makers campaign, please visit our Facebook page at www.facebook.com/HPMalaysia or HP DeskJet Ink Advantage Series.